Looking for a few examples on how to give your home a fresh new look in just a couple of days? Consider some of these DIY projects that will do the trick with minimal funds in no time at all! 1. Tidy up the exterior! Power washer rentals are pretty inexpensive nowadays (around $50-75/day), and are a great way to wash away years of dirt that might have accumulated on your house – just avoid the roof as you could do some damage to the shingles! Also, try switching your garden hose to the most powerful setting and spray those walkways, decks, and your driveway. Finally, make sure that you wash your windows – not just on the exterior, but on the interior as well to give them a nice clean Spring shine! 2. 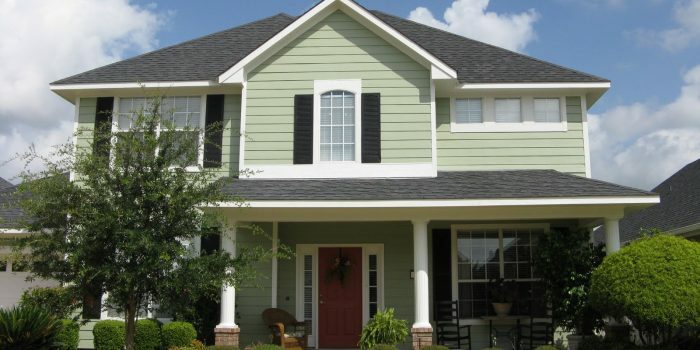 Replace paint in accent areas of your home such as trim, doors, and shutters. A gallon of paint can go a long way… and can make a WORLD of difference! Sprucing up your exterior colors by adding a fresh coat in select small areas can look like a big change when driving by! 4. Keep any porch furniture neutral. You may love the collection of wind chimes that you’ve been building up over the years, but it might be tough for future buyers to envision themselves in your musical living space. Try to keep your porch novelties minimal to entice guests into your lovely home. 5. Change out your mailbox. A mailbox upgrade can be huge… and can come at a very low price! You can either paint your current one, which will take a few hours and will have a low cost, or you can purchase a brand new one for under $100 to elicit a great WOW factor! 6. Update your light fixtures. These are a MUST! Outdoor sconces can be found for around $20, or to save on money a can of spray paint would be around $10. Freshening up these pieces will certainly draw some positive attention to your new clean looking home front! For more ideas on how to spruce up your home from the outside in, reach out today and I’d be happy to share more of my favorite tips & tricks!